His thick mane and tail fluff are a yellow-tinted white, though his curving horn is a more pure color, glistening and dangerous. The rest of his body is a gentle powderblue, lighter on his belly and the insides of his legs, as well as upon his muzzle. He is spotted with rosettes of turqoise, the center dots darker, like the depths of the ocean. He's an attractive fellow, despite how thin and relatively weak he appears. This Hyard actually seems to be more of a brain-over-brawn sort of dude, almost philosophical in nature. This isn't to say he mindspeaks any better than the rest of his species, his intelligence is less structured than that. Perhaps not an academic (he won't be able to tell you Planet's history), he is happy to learn, and to assist you in any studies you may have. This Amazonite is pretty friendly, content both around others and on his own. Independent, you won't have to worry about feeding him or taking him out to pee- he can do that by himself, thanks. Hers is a rather simple personality. Demure and quiet, she tends to keep to herself when it comes to conversation, but she does like to have somebody around so she's not completely alone. When she does speak up, she has a kind word for everybody, and is always willing to do little things to help out at her bonded to request. She's no big tough beast of burden, nor is she a very good guard Hyard; she tends to hide from conflict rather than face it, afraid of hurting anyone. She does what she can though, hopeful in the belief that every little bit she can do will help, even if it's just giving you a shoulder to lean on after a long day, or picking up your socks for the laundry when you didn't notice you dropped them. She's pretty little thing, lithe and sleek, although she'd be rather embarrassed to receive any compliments about it. A pink base is dappled with darker spots that stretch from head to rear end, morphing into rings around the length of her tail. Her face is bright pink with lighter markings beneath her eyes all the way down her cheeks, and her horn is a rather short one, although still cutely curved and a flawless black tone. Bright, bold green eyes provide an unexpected burst of contrasting color. With a beautiful gradient of scales, Clotho is clearly the youngest of her three sisters. She is the smallest Hyard, shorter in stature but leaner in form. She's got a narrow shape with a thin muzzle and a petite set of paws. Her scales are soft, almost oddly velvety and start with a bright and vibrant pink then blend and merge into a gorgeous crimson that stops at the tip of her long, relatively thin tail. Her dull black horn is a little bit short on the center of her head and her claws are thin, sharp, and a dull black as well. Her eyes shine a bright gold. Clotho is the mildest of the three sisters, she has an even temper and is generally pretty agreeable to be around. She is docile, more willing to listen then speak. She is kind and helpful, altruistic in her own right as she is willing to go out of her way to do good deeds for others. For the most part she is bright, generally cheerful, and willing to bring good cheer and a good mood to others around her. While she does have a large amount of wisdom, she seems to be the most naive and hopeful of her three sisters, she has some knowledge of herbs and medicine and has something of a "healing" touch. She has a sort of understanding of life and death that no one else has. It's rumored that she knows when life or death comes, but she will not answer if you ask. She thinks some things are best left unsaid. She mourns for the dead, but only as much as necessary. Personality: Brazen, bold, independant. This lady is all of these things. It’s not all roses and butterflies with her, oh no, she sees the lightning and the deep dark crevices that threaten the steps of those that aren’t wary. But she can get past it. And even though she could do it all on her own if she had to, she’d rather do it with you. She’s not looking for love, but she’s definitely looking for good company. Together, people can do anything. Danger is a thing she thrives on, the thrill of adrenaline and dodging things that seem impossible to evade. Meeting danger with a smile is her modus operandi. Better that she have someone to share that spark with. With her you can expect to be cherished, and whatever you get yourself into, she’ll be there, hollering the whole way. She walks in darkness often, not because she belongs there, but because she doesn’t. She tests the lines that were never meant to be tested. Thunderstorms are her favorite sort of danger, too. The closer she can get to a strike without incident, the more alive she feels. So don’t be surprised when, during hurricane season, you find her other roof, daring the wind and the elements to come and get her. And hopefully you’ll be willing to join her, because she really would love that. You are, after all, her chosen ally against the daunting. Appearance: She is a handsome cat. Not beautiful or pretty or any of those flowery words. You might think she is, but no, she’s handsome. Full, nicely rounded face, solid build, not entirely masculine but not entirely not, either. Her dark horn shadows over eyes that are misty silver. The base of her hide is a deep, dark purple that edges on towards black. 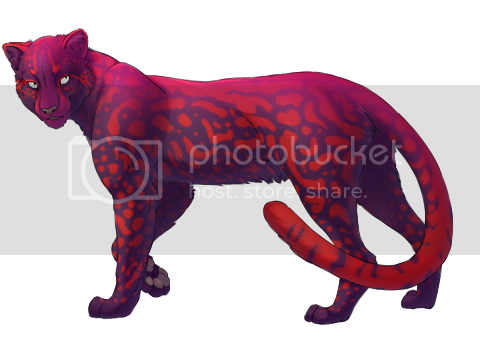 On top of this, scarlet spots patterned like an ocelot stand out brilliantly, overwashed by a deep rose pink hue that starts at her nose and spreads like a cape down her neck and back, ending halfway down her tail. Hyards are curious creatures in body, and in the case of this Obsidian, a curious creature in mind as well. Though not overly intelligent, she has a polite curiosity about anything. She hadn't already familiar with, and quite enjoy his having somebody explain things to her. She's not the best at discovering information on her own; she's much more sedate herself, calm and friendly and overall happy if not all that take-charge about situations. Of course, she has her grumpy days like anyone does, nobody can have the same mood 24 /7/365, but generally speaking, she's pretty content about life. The only thing she can't learn is speech, no more silver-tongued than any other Hyard ever has been. You can expect to learn just how expressive somebody who can't talk can be however. She doesn't tend to hide much. When she's holding still, she looks like she's been carved out of pure glossy obsidian that her rank takes its name from. In the right light, however, ribbons of color appear wrapping around her body in a wide continuous band looping all over her, practically glowing with cool blues and greens and subdue pinks and purples and reds, the hues bleeding in and out of each other. Her body is small and short but well-proportioned for itself, neither stumpy nor lanky, and her horn has a particularly subtle curve to its long, delicate curl. You will never meet a happier Hyard. If they could grin, she would have a perpetual smile on her muzzle. She's quick to find the good in things and loves absolutely everybody. She teases her friends, but it's in that light-hearted way that can actually come off as cute to most people. That doesn't mean she's completely innocent. She'll play pranks and have fun, however if it accidentally goes too far or upsets someone, she is quick to apologize and butter them up to make it all better. She is a very handsome Hyard. Like others of her rank, her beautiful black scales will take on a rainbow sheen when the light hits them just right. Her build is a little more stocky than most females, so at first glance some might think she was a male except for the fact that she's the coloration of an Obsidian.